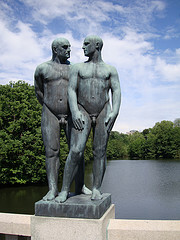 One of the more interesting spaces in Oslo is the Vigeland Sculpture Park, part of the larger Frogner Park. There are 212 granite sculptures, all designed by Gustav Vigeland in the first half of the 20th century. The statues range from men, women and children fighting an playing to a huge column of bodies. All of Frogner park is very popular in the summer. Tourists come to see the sculptures, and Oslo residents stretch out on the grass to read, barbeque, play, and otherwise soak up the sun. There are also concerts, a water park, and sports facilities that draw people in. The image on the right is one of my favorites of the pictures I’ve taken at the park. This sculpture is mounted on a bridge across a pond, and for me, this view makes me feel like I’m off by myself, away from people, even when others are right next to me. If you ever visit Oslo, this is one of the sights you must see. 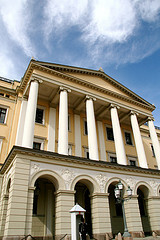 One of the future posts I’m planning is about Oslo’s new Opera house. I also have some general thoughts about living overseas that might interest some people. Telenor is Norway’s biggest telecom company. They were a state-run monopoly for a long time, before Norway opened up the phone system to competition. When I finally received the keys to my apartment (that’s another story, perhaps), it was suggested that I get a phone line through Telenor. At the same time, I was told how the universal opinion about Telenor was that they were extremely incompetent (this was by the same people who recommended them, by the way). I signed up with Telenor via their website, and followed up through their contact form after I realized that their signup form doesn’t ask for the apartment you live in. Over the course of three weeks, I received about three emails from them – the first one in response to my followup item, a second one asking for the apartment number, and a third one saying that a credit check showed that I had an outstanding balance with them, and that they couldn’t provide me with service as a result. After that last email, I called them up to find out what was going on. Well, they fixed that but couldn’t tell me when I’d get service. This was on a Thursday, and they told me they’d send me an SMS with the information by 4pm the next day. Well, Friday passes by with no SMS, so on Monday I call them back and find out they’ve scheduled the installation to be two weeks later! My stance on this was that they spent three weeks screwing around, they had damn well better get me a phone line sooner than that. They were terribly sorry, and were willing to give me a month’s credit, but they couldn’t get me a phone line any sooner. At this point I was rather annoyed and told them if this was the service they were going to provide prior to even getting me a working phone line, I wasn’t interested in going with them. So, I canceled my order. I called another company and had an installation date in less than 24 hours, even with a quick email exchange they initiated to verify some information. So now, I’ll have a DSL line ready to go the day after I get back from the States. Apparently I really amazed people by canceling with Telenor. Norwegians are used to that level of service from them and just accept it without complaint – at least, without complaint to Telenor or any regulatory agency. Personally, while I realize I have to get used to many of the differences here, suffering silently through poor service is one thing that I refuse to do. And that’s my experience with Telenor. I’m still trying to decide what my next post will be about, but I’ll work on making it a more positive one. Well, look what you’ve done. You’ve stumbled across yet another blog, which may or may not be of interest to you. Now that you’re here, you might as well find out a bit more about me. As the name of the blog implies, I’m an American living in Oslo, Norway. I moved here in June 2008, after spending over a year and a half in London. My family considers me a world traveler, but I know many people who have been more places than me, so I don’t think 4 continents really qualifies me as a “world traveler”. I’m just someone who wanted to do something different, and the opportunities that have presented themselves let me here. I’m an IT worker – providing support for a major product that most people will never know they’re using, but provides important functionality to public and private sites all over the world. I’m going to use this blog to talk about the good and bad things that come with living in Oslo. Hopefully I’ll be able to make sure the good things outweigh the bad things. Shortly, though, I’ll post about Telenor, the major phone provider, and definitely not a good company.